Monday to Friday: 9:00h. to 20:30 h.
Helping readers to consult the free access collection to find documents. Providing help in the catalogue consultation. Reporting on catalogues of other libraries, etc. General collection. Access is free; user can find encyclopaedias, dictionaries, yearbooks, legislation books, basic manuals, literary works, etc. Local collection. Access is free, it informs about subjects concerning Calp. 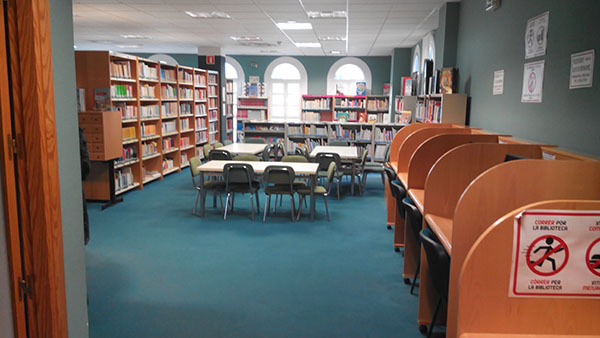 The Library is equipped in all its facilities with WIFI zone. It also offers 4 public computers for consultation with Internet access plus 9 tables with electrical connections for laptops. Use must respect the regulations, on request in the counter of the Room for Consultation and Reading. Through Internet users can access the catalogue of many libraries or free documents in virtual libraries. It is located in the same Room for Consultation and Reading. Access is free and the collection is excluded from the loan. The collection consists of books for home loans. To use this service it is necessary to have the reader's card, which can only be used by its holder. The card is free and is requested in person at the Library. Any user in possession of the reader's card will be able to use the loan service of all the libraries integrated in the Electronic Network of Valencian Public Reading. The reader interested in a special document that is already borrowed, can make its reservation. Through the interlibrary loan users can request documents from any library, with the limitations established by the owner Library. Users can suggest the purchase of documents that are not in the Library collection, which are of interest, as long as the documents coincide with the purchase policy of the Library. It is located in the same Room for Consultation and Reading.